As I fumed into the phone last night at the woman from East-West Logistics who shipped our Buddha statues from China, I paused to note the irony of it all. It occured to me that I was way too attached to the outcome of whether or not we'll pay extra fees to extract our treasures from the Port of Baltimore. My attachment to outcomes seems to be showing up a lot these days. Whether it's my controlling insistance that all other living creatures in the household live up to my standards of homekeeping, or my temptation to do an end-run around my husband's reasonable resistance to me dropping everything to pursue a career in the arts...detachment and patience are elusive friends. 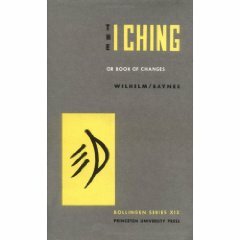 The I Ching tells me I should not act out of frustration, anxiety, despair, or desire to escape the situation. Instead, I'm to still myself and look for the lesson hidden inside the difficulty. I'm to correct my attitude until it is open, detached, and unstructured...abandon my goals and stay on the path, where I'm to proceed step by step. For a girl who likes to plan and get on with it, this is going to be quite the challenge.